Let's start off with the treats which honestly out of everything are the hardest for me to judge because I obviously never try them myself, and to be honest Molly will go for anything that's food (she's one classy chick). But as usual Pawsome had lots of yummy treats to offer in this month's box. I actually got a little confused with what treats were in this box (the fish and cheese ones definitely were), but I'm not sure about the others - honestly we've had such a build up of treats from Pawsome, it's hard to keep up! The toys this month are possibly my favourites ever. I mean just look at this funky rainbow guy. I don't know if it's intentionally Pride related, but if it is kudos to Pawsome for including it in the box for Pride month. Adding to the quirky toys, there's also this fun carrot toy which is made from natural non synthetic materials so anyone with a sensitive dog doesn't need to worry! And finally there were the two care items, a flea comb and a little football waste bag container. The flea comb is something that we won't be using just because Molly uses a flea treatment anyway so that was a little disappointing. On the other hand though this cute football shaped waste bag holder will definitely be handy on walks. Thank you for reading lovelies! Have a lovely week. 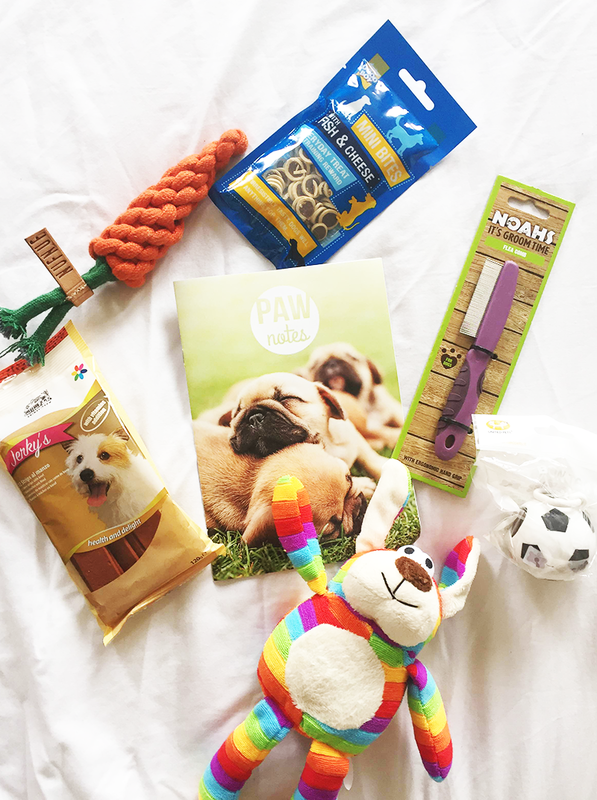 Seriously every time I read your Pawsome box review, it makes me wish I have a dog! This month's box is a good one and I like it better than the previous box.